I'm not one to normally wear green and I think I probably have only one or two pieces of green clothing in my wardrobe but mint green is such a pretty colour! Actually I think any mint or pastel colour would look really nice because the colours are so dreamy. I love asymmetrical cuts so when I saw this dress, it was definitely something I had to have. And because I know how it would look on me since I bought a red version last year but the skirt bit was just a straight cut so it was a bit more plain (but the red colour wowed enough). I also don't have a lot of fancy events to go to that requires dresses like these and whenever I need to get dressed up, I prefer to wear separates so I can mix and match and do what I like - but wearing a dress would definitely be so much easier! You look so incredible in this dress ! I love sea <3 Great place! Love the minty colour of the dress! You look amazing! 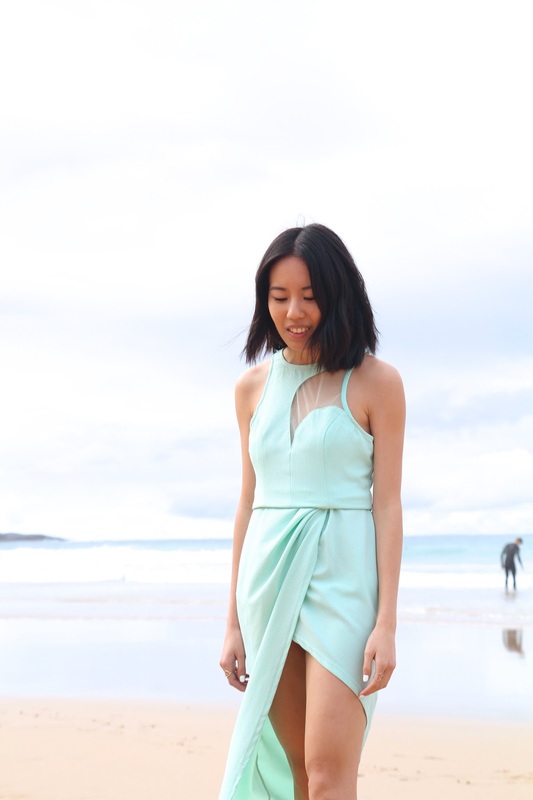 Mint is beautiful on you, and the dress makes you look like a mermaid!